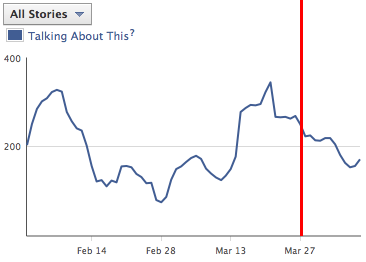 It has now been two weeks since I switched my Facebook Page to Timeline. While I’ll openly admit that early results should be taken with a grain of salt, monitoring the changes remains enlightening. This blog post is going to focus on four things: Reach, Engagement, Page Views and Tab Views. I’ve added a red dividing line to separate pre and post-Timeline. There is a noticeable improvement in Reach since I switched to Timeline. My move was made on March 27, and that is exactly when the spike begins. From that point forward, I was seeing month-high Reach numbers. That shouldn’t be a major surprise. What is encouraging is that the trend has continued through April 8. While that isn’t definitive, it’s certainly a good sign. Something I wanted to check was whether the spike was relative to number of Likes. If curiosity about my Timeline significantly increased the number of Likes, that would logically drive Reach going forward. But that’s not really the case. I received 37 new Likes on March 28, but I had seen similar spikes the previous two weeks (I reached 42 Likes in a day on both March 14 and March 20). During the time since I switched to Timeline, I’ve averaged 15.9 new Likes per day. In the 17 days prior to the switch, I averaged 17.5. So I guess that’s good and bad (or neutral). No noticeable change in Likes. But I’m reaching more people. In Conclusion: Reach has remained consistently up since my switch to Timeline, but it’s only up relative to the prior month. I have had much stronger Reach numbers during other stretches in 2012. So I’m not drawing any conclusions at this point. As you can see, my “Talking About This” is not consistent. While engagement dropped some since the move to Timeline, it’s still higher than it was one and two months ago. 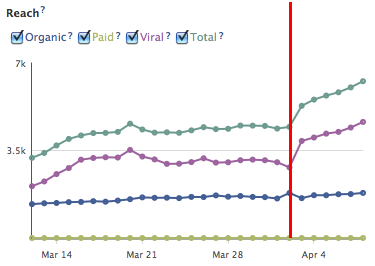 In the end, there is no clear positive impact of Timeline on my engagement in early results. That said, I’m of the belief that Timeline won’t impact this much. Whether or not people “talk about” my content is largely determined by the quality of content I share and the way that I frame it. In Conclusion: Nothing can be determined yet. This is one that you’d expect to go up. 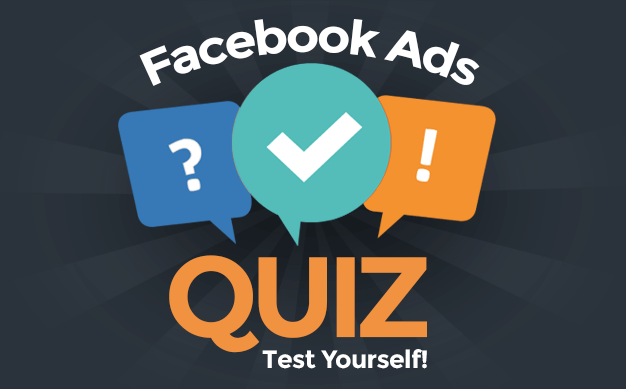 The entire purpose of Timeline is to make your Facebook Page a destination. So if Page Views remain steady or drop, that’s a pretty significant failure. The average number of Page Views from March 27 – April 8 is 193.5 from an average of 47.6 Unique Visitors. From March 10-26, the average number of Page Views is 123.1 per 33.3 Unique Visitors. Of course, this is significantly impacted by the first day. Take out that day, and the difference isn’t as pronounced. And the activity is actually trending downward, below prior levels (though it’s only a sample size of three days). In Conclusion: Page Views and Unique Visitors are up, but recently trending downward. Too early to make any connections. This is what I’m most concerned about. It’s where I get new subscriptions and drive people to my content. From March 1-26, I had 14 tabs that received a total of 380 Views. From March 27 – April 8, I have eight tabs that have received a total of 588 views. That’s 14.6 views per day before Timeline and 45.2 views per day after. Again, some of that is likely curiosity. Some of it may be me. But even during the low engagement period of April 6-8 (unlikely any of these numbers are me), my tabs are getting 18 views per day. In Conclusion: Tabs are definitely getting more views now than they were before Timeline. There are a lot of sites making definitive statements about how Timeline is or isn’t increasing engagement. For me, it’s way too early to tell. In some cases, I’ve seen a bump. In others, there appears to be little difference. The one area which I can confidently say is getting improved results is my tabs. Will it last? Does Facebook Timeline drive more tab views? Check with me in a couple more weeks. What results are you seeing so far with Timeline?